1. Don’t go starving. If you go to an event on an empty stomach, you will be more likely to eat all the goodies you normally try to avoid (what’s “one more bite” right?). So plan ahead and have a salad, healthy snack, green juice or fruit smoothie before you leave the house. You will arrive with your willpower intact. 2. Drink more water (in other words, don’t drink a whole meal’s worth of calories in sugary drinks). The weather is hot and you will want to keep drinking whatever drinks are offered, if you know the selection will be high-calorie sugary drinks or similar, then opt for water with a slice of lemon (or bring your own drinks with you). Those sugary drinks seem to make you even thirstier and you will drink more than you normally would, one after another – water is a much better thirst-quencher! 3. Use a smaller plate. Instead of going through the buffet line with a large plate and piling it high, go through with a smaller salad plate or similar that will look full faster. Make it a point to actually put all the food you will eat on your plate – rather than picking all those bite-sized things up and popping them in your mouth while you are going through the line or walking around. This will keep you from mindless eating and you will be able to keep better control of your portion sizes too. 4. Bring your favorite healthy dish (and eat it if nothing else works out). 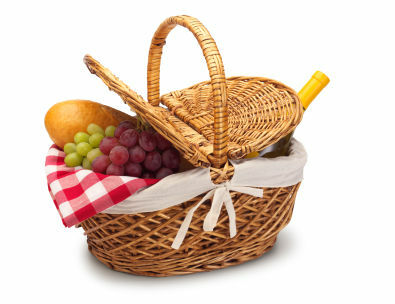 Not sure what foods will be at the picnic? Most folks bring a dish to these events anyway, so be sure to bring your own personal favorite healthy dish, maybe it’s a great tabbouleh salad, a fresh chunky salsa made from your garden veggies, yummy Sunflower Dip (free recipe below) or a more deluxe healthy dish. Worst case scenario, you have at least this one dish you can eat without regret and hopefully there are other healthy choices you can add to it on your small plate as well! 5. Find the activity and hang out there (instead of next to the food table). Kids playing tag? Flying kites? Walks along the beach or in the woods? A rousing game of badminton or cards? Find out where the activities are happening and go join or watch. You will be less likely to nibble extra food if you are not right next to the food tables the whole time. Remember the other golden rule: Don’t beat yourself up too much when you do veer off the healthy eating path, get right back on it tomorrow. It is a party and you may get cornered by Aunt Sally who is insisting you try a bite of her sugar and butter-filled dessert that was a traditional recipe from your great-grandmother. Perhaps you are feeling too “deprived” and you keep snacking on things that you normally would avoid. Assuming you did not go off the deep end and eat the entire dish after the bite you tried, you shouldn’t put a bunch of regret on your shoulders. If you try even a couple of the ideas above, you will be better of than most, plus you can always drink green drinks and healthy smoothies the next day and take an extra walk or two during the week. The important thing is to enjoy the people at the event and the conversations, don’t find yourself saying “no thank you” to fun time spent with friends and family just because you are worried about the food. What tips and tricks work for you at parties, holiday feasts and similar? Share in the comments below. We can all get healthy together! Add 1 tsp E3Live original for an extra nutritional boost! Blend all ingredients in a food processor until you get a thick, dip-like consistency, add more water if too thick or more seeds if too thin. 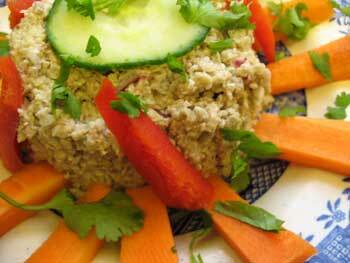 Eat as a meal by itself or use as a dip with veggies, flax crackers, etc. Can also be used as a filling for mushrooms or other “stuffable” veggies! Enjoy! ← Three E3Live Smoothies Kids Will Love! Came Upon this on Pinterest! Looks Yummy!